Way back in 2004 a longtime esteemed Rustie and Neil Young fan by the name of Mike "Expecting 2 Fly" Cordova posted a series of articles on his experience listening to all of Neil Young's albums in chronological order. It was his journey, his self-appointed task. So, which albums will you review? 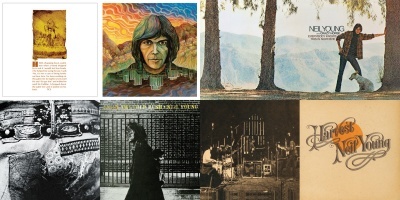 All 49 the Neil Young studio albums in chronological order: Neil Young (1968), Everybody Knows This Is Nowhere (1969), After the Goldrush (1970), Harvest (1972), On the Beach (1974), Tonight's the Night (1975), Zuma (1975), Long May You Run (1976), American Stars 'n Bars (1977), Comes a Time (1978), Rust Never Sleeps (1979), Hawks & Doves (1980), Re-ac-tor (1981), Trans (1982), Everybody's Rockin' (1983), Old Ways (1985), Landing on Water (1986), Life (1987), This Note's for You (1988), Eldorado (1989), Freedom (1989), Ragged Glory (1990), Harvest Moon (1992), Sleeps with Angels (1994), Dead Man (1995), Mirror Ball (1995), Broken Arrow (1996), Silver & Gold (2000), Are You Passionate? (2002), Greendale (2003), Praire Wind (2005), Living with War (2006), Chrome Dreams II (2007), Fork in the Road (2009), Le Noise (2010), Americana (2012), Psychedelic Pill (2012), A Letter Home (2014), Storytone (2014). Why Chrome Dreams II and No Chrome Dreams? The first Chrome Dreams album was a bootleg and never officially released. Why include two soundtrack albums, "Dead Man (1995) and "Greendale (2003), but exclude the other two soundtrack albums, "Journey Through the Past" and "Where the Buffalo Roam"? "Dead Man" and "Greendale" are original albums, composed, recorded, and played by Neil Young. "Journey Through the Past" falls more into the greatest hits/compliation album category. "Where the Buffalo Roams" was scored by Neil Young, but the majority of the soundtrack features music by other artists. What? Fourty-nine album reviews not enough for you? Calm down. Wait a minute, isn't "Rust Never Sleeps" a live album? Not exactly, it's kind of an intermediate. Although the foundation tracks were recorded live, many of the tracks were later overdubbed in the studio. Additionally, there is another Neil Young album from the same time period called "Live Rust" which is a true live album featuring much of the same material. Why should anyone care about your opinions on records that were in, some cases, released over 40 years ago? Hasn't enough been written about Neil Young? Good point. No one should care. I like Neil Young and I'm just having fun. Continue to Live Like Dirt for reviews of all 49 Neil Young studio albums. There are some other marathon reviewers around. I had a lot of fun with Don Ignacio's, who has original views, doesn't care much about reputations and idées reçues, and has a nice way of being honest about his hangups and prejudices. It must be recognized, and I don't know if anyone else has EVER done it, but Neil opens his debut solo album with an instrumental. He is STILL the perfect stranger. Sorry to be picky but isn't that only (!) 39 albums? @ wardo - thanks! Yes, we recall your reviews and will post again in near future. Thanks for reminder. Yes, he is STILL the perfect stranger. @ alibongo - picky, 39 albums reviews is still a lot of work. Poor us.